Created by the Interactive Media Council (IMC), the IMA program represents the very best in website planning, execution and overall professionalism. 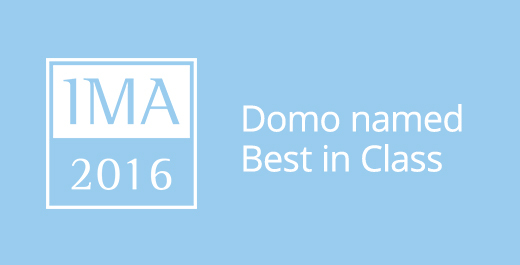 Domo was named a 2016 IMA Best in Class winner by achieving an overall score of 491 out 500, based on five core criteria, each of which accounted for 100 of the 500 possible points: design; content; feature functionality; usability; and standards compliance. Domo earned 100 percent on three of the criteria: design, content and feature functionality. The IMA is an international recognition program created to recognize and elevate standards of professional and ethical excellence for the Internet, encompassing site content, usability, compatibility and code quality, among others. The awards are open to nominations from advertising agencies, internal corporate marketing departments and web design firms, as well as individual graphic artists and web designers. For more information on winners, please visit here.